Master Builders KwaZulu-Natal: Why a Roof Garden ? With regard to the greening of our Westville premises, something I haven’t really touched on yet is our roof garden situated on the ledge just above the ground floor. The ledge itself is about 4 meters wide and it runs the full length of the building. Our green interventions incorporate the use of wind turbines and photovoltaic panels for the purpose of generating our own clean electricity, but why a roof garden, what purpose does it serve? As a result of the incredible ability of plants and soil to shield a roof surface from absorbing heat, the cooling effect of a well thought out roof garden can considerably reduce energy consumption. For example, a cooler building is far less dependent on air conditioning and in places like sunny Durban, air-conditioning impacts heavily on electricity usage. Plants and soil also disperse water which not only cools the surrounding air; it also makes it more comfortable to breathe. When putting it all together, we consulted with experts to determine which plant species would contribute most to biodiversity. 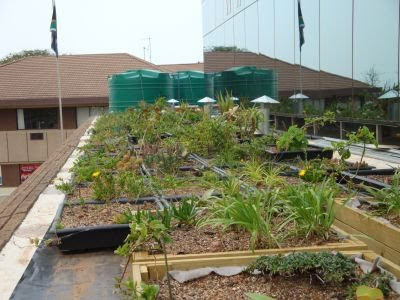 It is for this purpose that the Master Builders KwaZulu-Natal roof garden is wholly comprised of indigenous vegetation.